The user interface of an iOS app is like a storefront – the application typically gets one Window, but it can fill the Window up with as many objects as it needs, and the objects and arrangements can be changed depending on what the app wants to display. The objects in this scenario - the things that the user sees - are called Views. 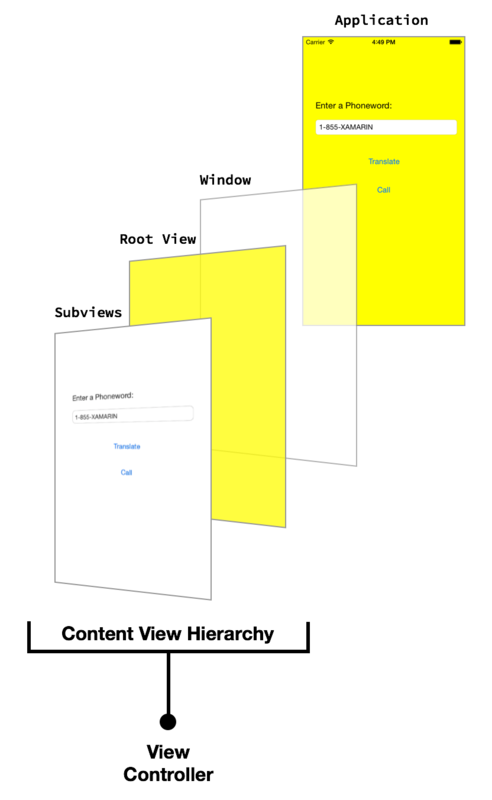 To build a single screen in an application, Views are stacked on top of each other in a Content View Hierarchy, and the hierarchy is managed by a single View Controller. Applications with multiple screens have multiple Content View Hierarchies, each with its own View Controller, and the application places Views in the Window to create a different Content View Hierarchy based on the screen that the user is on. These view hierarchies can be constructed using the Xamarin Designer for iOS in Visual Studio, however it is good to have a fundamental understanding of how to work entirely in code. This article walks through some basic points to get up and running with code-only user interface development. These view hierarchies can be constructed using the Xamarin Designer for iOS in Visual Studio for Mac, however it is good to have a fundamental understanding of how to work entirely in code. This article walks through some basic points to get up and running with code-only user interface development. AppDelegate.cs - Contains a UIApplicationDelegate subclass, AppDelegate , which is used to handle application events from iOS. The application window is created in the AppDelegate's FinishedLaunching method. Main.cs - Contains the entry point for the application, which specifies the class for the AppDelegate . Info.plist - Property list file that contains application configuration information. Entitlements.plist – Property list file that contains information about the capabilities and permissions of the application. 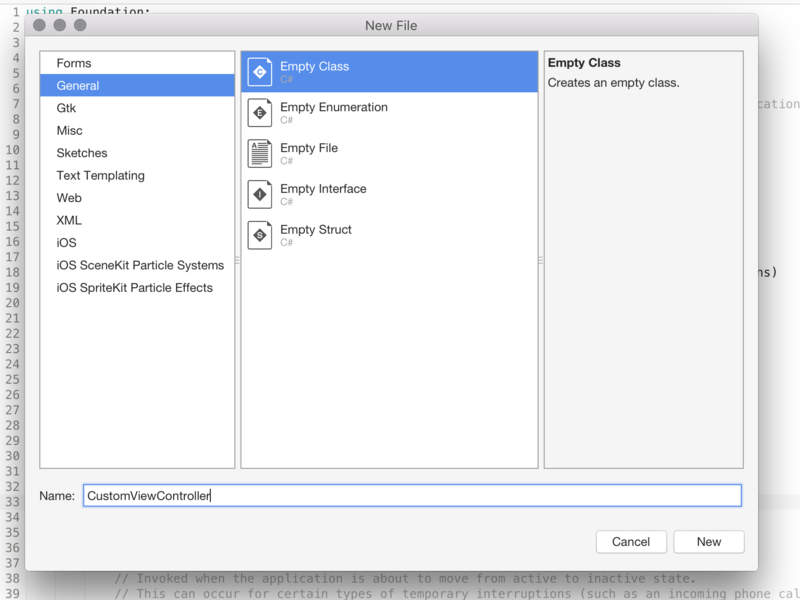 Visual Studio for Mac does not provide an Empty template. All templates come with Storyboard support, which Apple recommends as the primary way to create a UI. However, it is possible to create your UI completely in code. 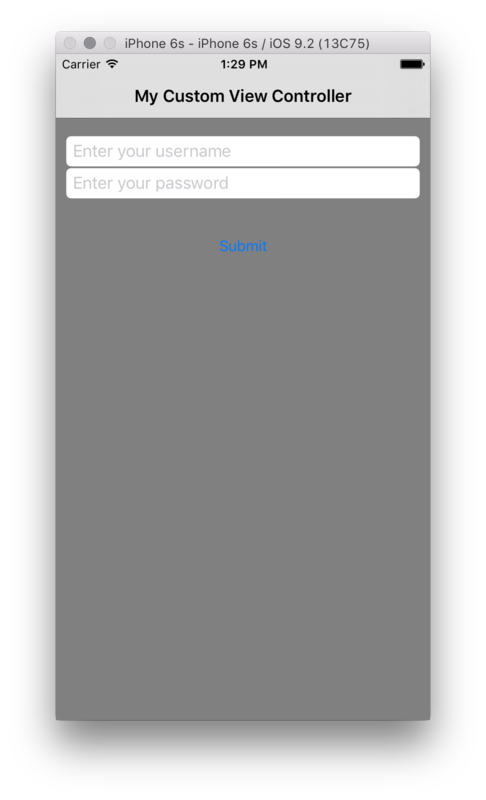 The code that was added to the FinishedLaunching method in step 5 above, is the minimum amount of code required to create a Window for your iOS application. iOS applications are built using the MVC pattern. The first screen that an application displays is created from the window's root view controller. See the Hello, iOS Multiscreen guide for more details on the MVC pattern itself. If you were to run this application now, you would likely get an exception thrown stating that Application windows are expected to have a root view controller at the end of application launch. Let's add a Controller and make it the app's Root View Controller. 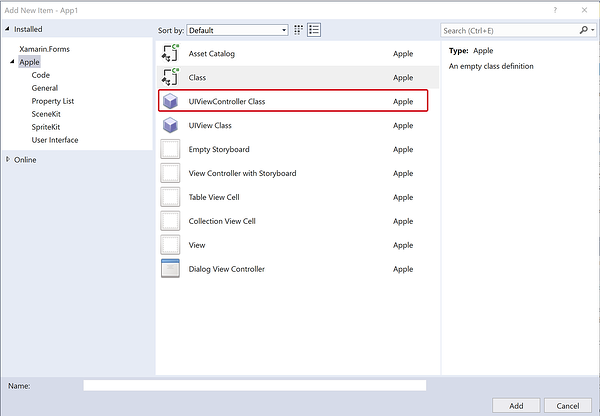 Now that we've seen how to add a controller as the RootViewController of the window, let's see how to create a custom view controller in code. UIViewController contains a method called ViewDidLoad that is called when the View controller is first loaded into memory. This is an appropriate place to do initialization of the view, such as setting it's properties. In the example above, we started to create a user interface in code by adding a button to the View Controller. iOS user interfaces are comprised of a view hierarchy. Additional views, such as labels, buttons, sliders, etc. are added as subviews of some parent view. 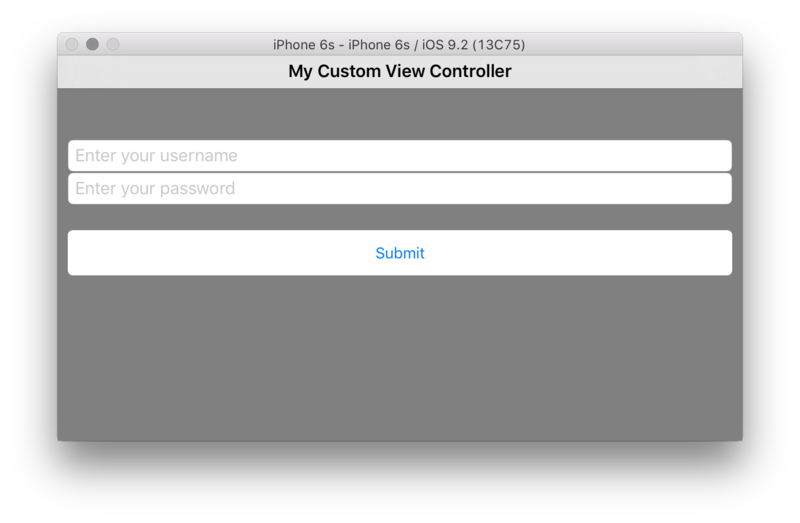 For example, let's edit the CustomViewController to create a login screen where the user can enter a username and password. 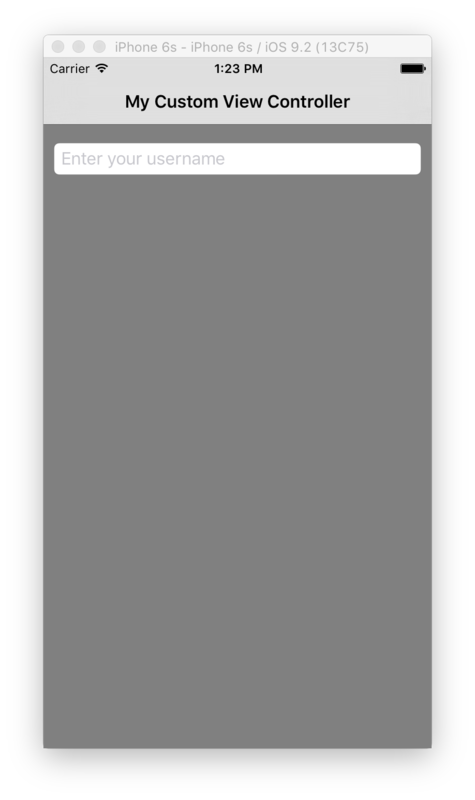 The screen will consist of two text fields and a button. First, remove the button and event handler that was added in the Initializing the View section. When we create the UITextField, we set the Frame property to define its location and size. In iOS the 0,0 coordinate is in the upper left with +x to the right and +y down. After setting the Frame along with a couple other properties, we call View.AddSubview to add the UITextField to the view hierarchy. This makes the usernameField a subview of the UIView instance that the View property references. A subview is added with a z-order that is higher than its parent view, so it appears in front of the parent view on the screen. 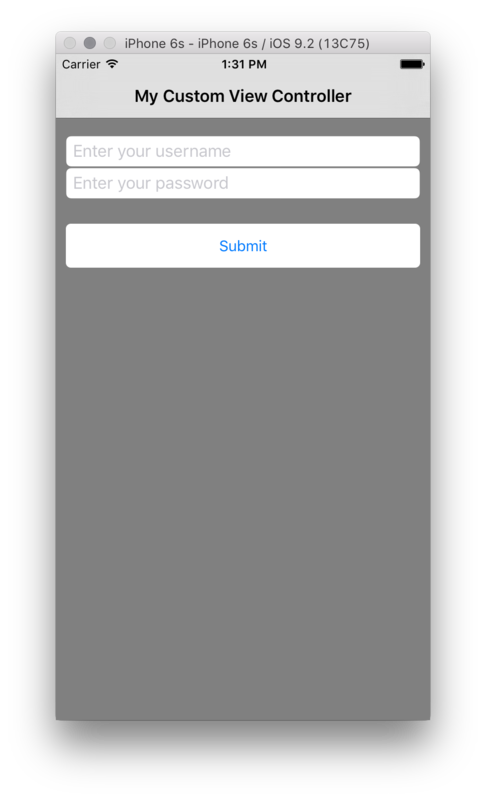 Next, we'll add a button so the user can submit the username and password. The button is added to the view hierarchy like any other control, by passing it as an argument to the parent view's AddSubview method again. iOS provides a facility to add multiple views to the view hierarchy by using AddSubviews. When a button is clicked, your users will expect something to happen. For example, an alert is shown or navigation is performed to another screen. Let's add some code to push a second view controller onto the navigation stack. Notice that by default, when you use a Navigation Controller, iOS gives the application a navigation bar and a back button to allow you to move back through the stack. This, however will not work if the view being iterated for is a UIView as all views will come back as being a UIView as the objects added to the parent view themselves inherit UIView. One way to fix this is by setting the AutoresizingMask property on each view. In this case we want the controls to stretch horizontally, so we would set each AutoresizingMask. The following example is for usernameField, but the same would need to be applied to each gadget in the view hierarchy. In addition to using controls that are part of UIKit, custom views can also be used. 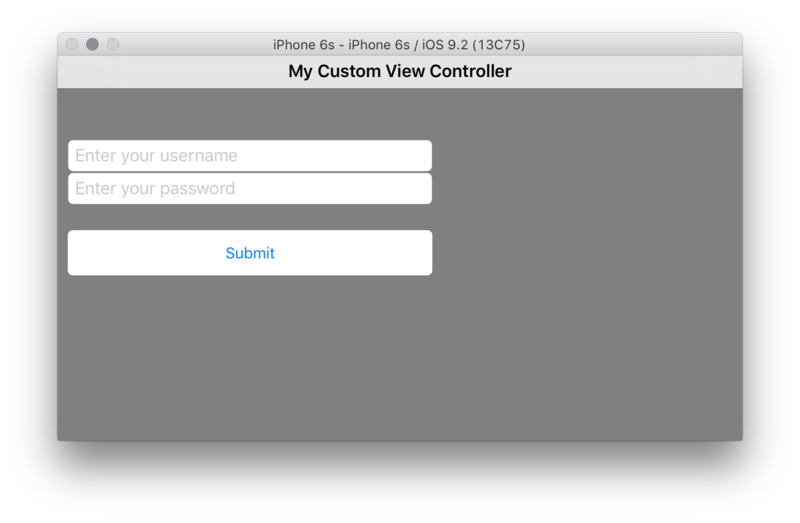 A custom view can be created by inheriting from UIView and overriding Draw. Let's create a custom view and add it to the view hierarchy to demonstrate. The first thing we need to do is create a class for the custom view. We'll do this using the Class template in Visual Studio to add an empty class named CircleView. The base class should be set to UIView, which we recall is in the UIKit namespace. We'll also need the System.Drawing namespace as well. The other various System. * namespaces won't be used in this example, so feel free to remove them. Every UIView has a Draw method that is called by the system when it needs to be drawn. Draw should never be called directly. It is called by the system during run loop processing. The first time through the run loop after a view is added to the view hierarchy, its Draw method is called. 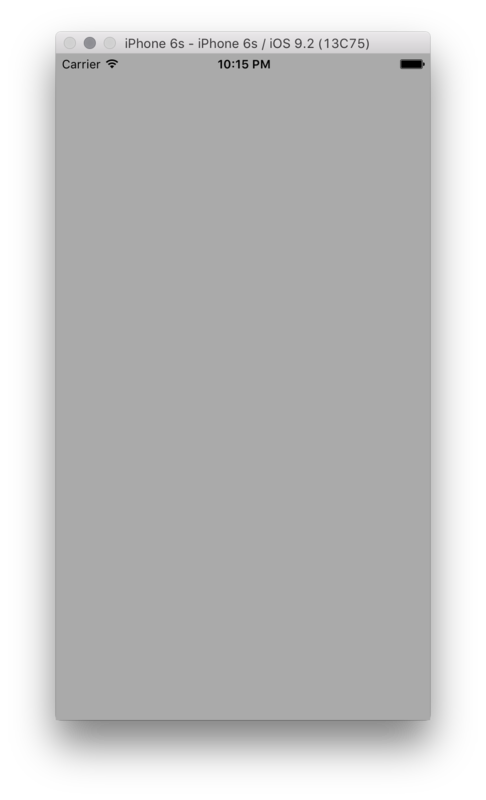 Subsequent calls to Draw occur when the view is marked as needing to be drawn by calling either SetNeedsDisplay or SetNeedsDisplayInRect on the view. To use the CircleView we just created, we can either add it as a subview to the view hierarchy in an existing controller, as we did with the UILabels and UIButton earlier, or we can load it as the view of a new controller. Let's do the latter. 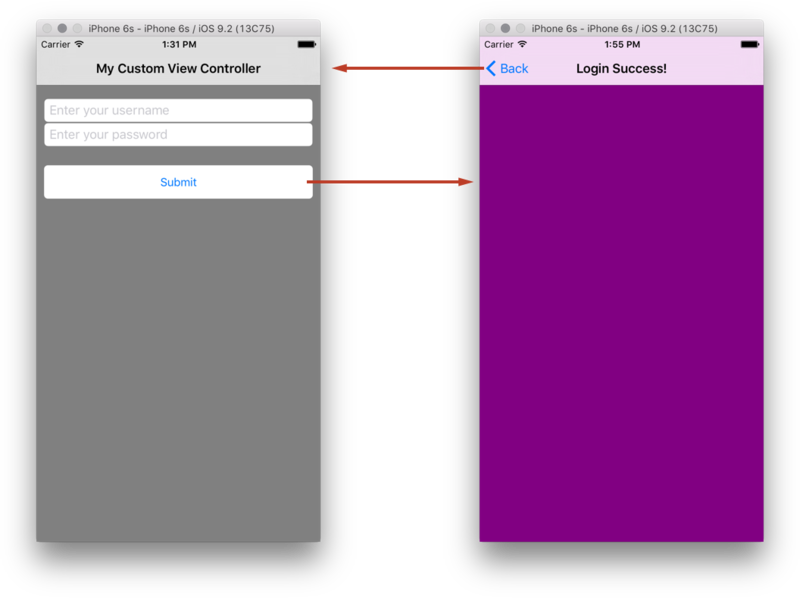 UIViewController has a method named LoadView that is called by the controller to create its view. This is an appropriate place to create a view and assign it to the controller's View property. First, we need a controller, so create a new empty class named CircleController. A launch screen is displayed when your app starts up as a way to display to your users that it is responsive. Because a launch screen is displayed when your app is loading, it cannot be created in code as the application is still being loaded into memory. 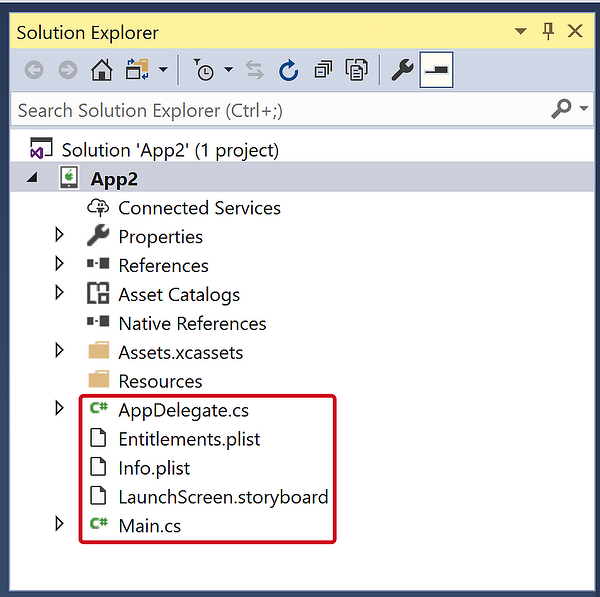 When you create an iOS Project in Visual Studio, a Launch Screen is provided for you in the form of a .xib file, which can be found in the Resources folder inside your project. When you create an iOS Project in Visual Studio for Mac, a Launch Screen is provided for you in the form of a Storyboard file. This can be edited by double clicking on it and opening it in the iOS Designer. Apple recommends that a .xib or Storyboard file is used for applications targeting iOS 8 or later, When you launch either file in the iOS Designer, you'll use Size Classes and Auto Layout to adapt your layout so that it looks good, and displays correctly, for all device sizes. A static launch image can be used in addition to a .xib or Storyboard to allow support for applications targeting earlier versions. As of iOS 9, Apple recommends that Storyboards should be used as the primary method of creating a Launch Screen. 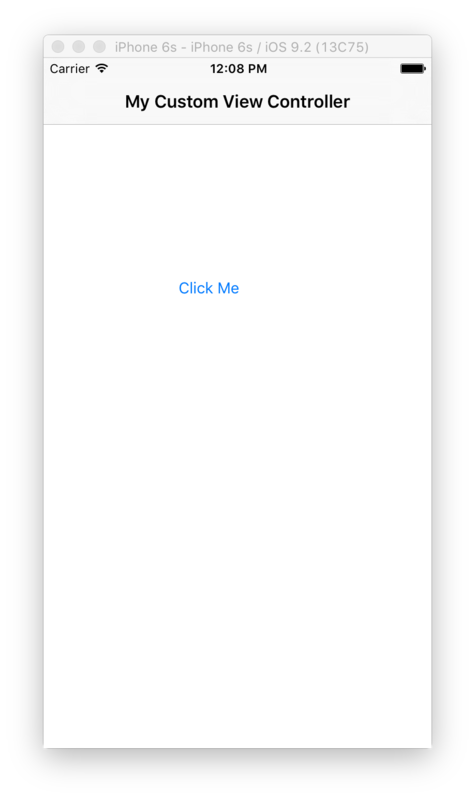 A static image can be used in addition to a .xib or Storyboard launch screen if you application targets versions previous to iOS 8. 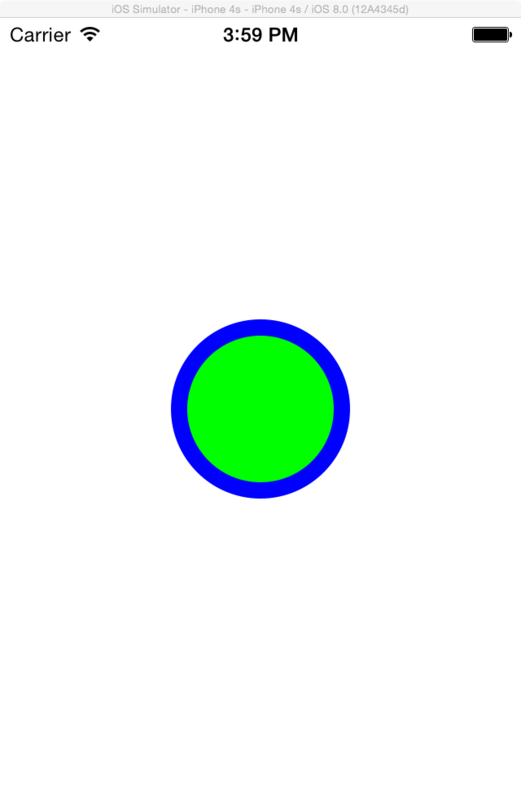 This static image can be set in the Info.plist file, or as an Asset Catalog (for iOS 7) in your application. You will need to provide separate images for each device size (320x480, 640x960, 640x1136) that your application may run on. For more information on Launch Screen sizes, view the Launch Screen Images guide. If your app has no Launch Screen, you may notice that it doesn't fully fit the screen. If this is the case, you should make sure to include, at least, a 640x1136 image named Default-568@2x.png to your Info.plist. 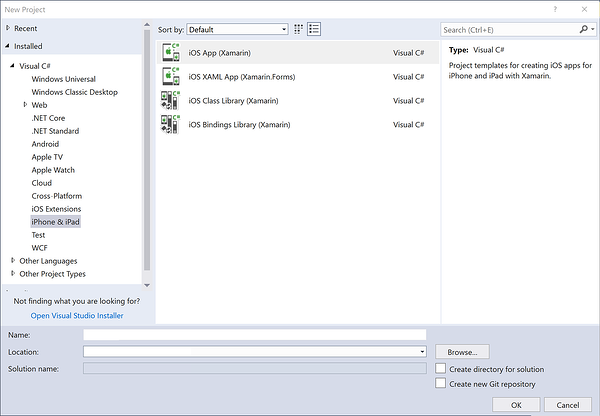 This article discussed how to develop iOS applications programmatically in Visual Studio. We looked at how to build up a project from an empty project template, discussing how to create and add a root view controller to the window. We then showed how to use controls from UIKit to create a view hierarchy within a controller to develop an application screen. Next we examined how to make the views lay out appropriately in different orientations and we saw how to create a custom view by subclassing UIView, as well as how to load the view within a controller. Finally we explored how to add a launch screen to an application. 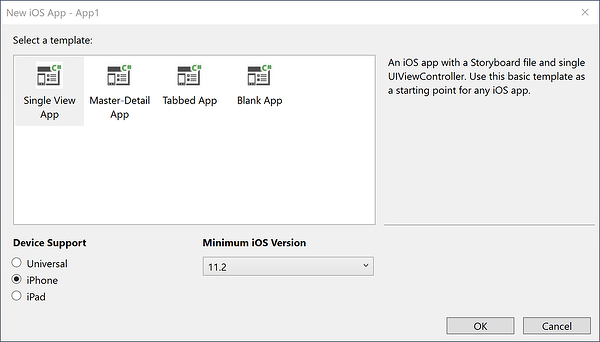 This article discussed how to develop iOS applications programmatically in Visual Studio for Mac. 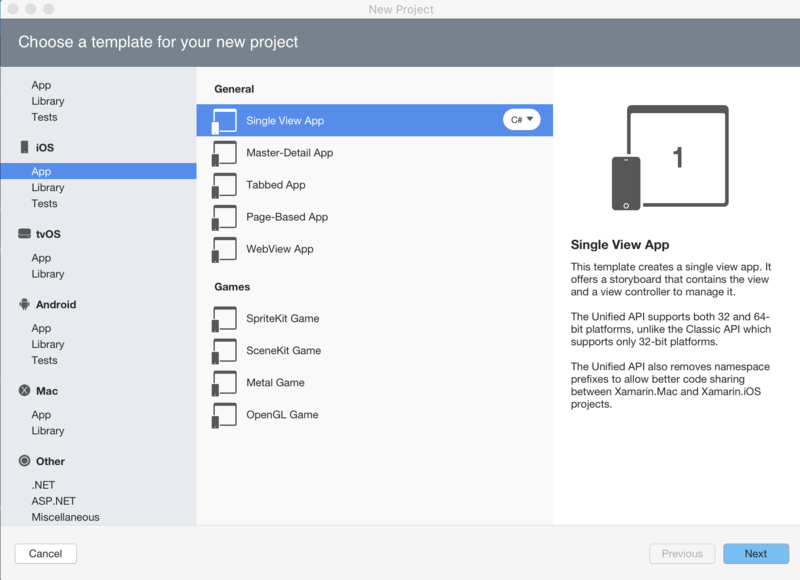 We looked at how to build up a project from a Single View template, discussing how to create and add a root view controller to the window. We then showed how to use controls from UIKit to create a view hierarchy within a controller to develop an application screen. Next we examined how to make the views lay out appropriately in different orientations and we saw how to create a custom view by subclassing UIView, as well as how to load the view within a controller. Finally we explored how to add a launch screen to an application.